Peter studied at the University of Leeds, the Open University, and Keele University, where he gained a doctorate for a thesis examining the roles of history in Paul Scott’s Raj Quartet. He moved from the University of Gloucestershire to Newman University in April 2013. Prior to joining the University of Gloucestershire as a lecturer in English in 1999, Peter worked in the Media, Critical and Creative Arts Faculty at Liverpool John Moores University. Peter has overall oversight for research developments to support both staff and research students. Alongside responsibilities as a member of the Senior Management Team, his role involves internal strategic research development and external liaison with local, regional, national and international organisations. 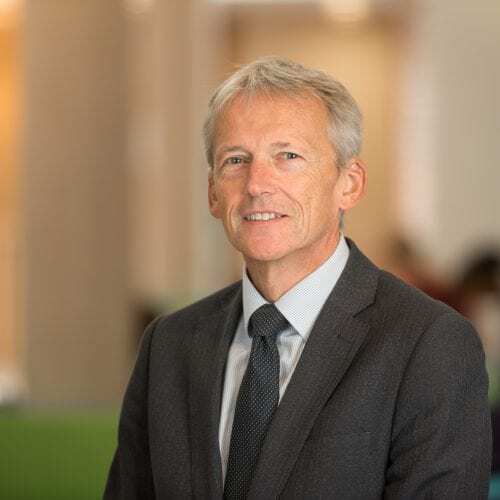 A Professor since 2003, Peter has been a member of regional and national bodies including the HERDA Research Special Interest Group, the Association of Research Managers and Administrators (ARMA) and the Association of University Research and Industry Links (AURIL). With a first degree in Economics, Peter came to higher education from industry having worked as a Senior Analyst/Programmer for 3M (UK) Plc. He was awarded a National Teaching Fellowship by the Higher Education Academy in 2004 and was elected a Fellow of the English Association in 2005. In terms of his personal research, Peter has edited or written over twenty books on diverse subjects ranging from contemporary British culture to post-colonial theory. Peter’s early published works include Post-Colonial Theory and English Literature, Paul Scott’s Raj Quartet, The Twentieth Century in Poetry, and Modernism: the New Critical Idiom. More recent publications include Contemporary Novelists: British Fiction Since 1970 for Palgrave Macmillan, Texts: Contemporary Cultural Texts and Critical Approaches for Edinburgh University Press, The Routledge Dictionary of Literary Terms, and books on Modernism and the Post-Colonial and Aesthetics and Ethics in Twenty-First Century British Novels for Continuum. He is currently researching and publishing on Ian McEwan, Julian Barnes and contemporary British fiction. Peter has published extensively on twentieth-century literature and culture. His main research interests are modernism, colonial and post-colonial writing, and contemporary fiction. Peter is Deputy Vice-Chancellor – Research and Scholarship and, among other responsibilities, chairs the University’s Research Committee. External Examinerships: South Bank University, English and Theatre BA Programme, 2002-6; Bath Spa University, Masters by Research, 2004; University of East London, English and Media BA Programme, 2003-7; Oxford Brookes University, Masters in English, 2010-14. Research examinations: Gandhi (1998), Jabannavar (1999), Bridges (2002), Wilson-Copp (2007), Pegram (2008), Irani (2009), Li (2010), Chandler (2011), O’Connell (2012), Brook (2013), Sanchez (2013). Research completions: Schulenberg (2001), Wroe (2004), Greenfield (2006), Randall (2006), Ferenz (2006), Green (2007), Johnstone (2012), Helewise (2013), Williams (2013).